The problem with the CBS adaptation of Arthur Conan Doyle’s classic mystery tales was that the show was becoming the very thing it so often surpassed: A procedural. On paper, “Elementary” is just another Sherlock Holmes adaptation, made for a TV market saturated in weekly mysteries. It could be very easy to write it off as more of the same — but since its premiere, it’s been something more. The show never simply rehashed the original stories, or tried to update the setting with the simple addition of cell phones. Instead the writers and actors decided to truly bring Holmes to the 21st century, with reality ensuing across the Great Detective’s life. It thus became a character-driven story of observation and recovery, with mystery-solving serving more as a tool for character exploration than a cheap formula to drive each week. By doing so, “Elementary” kept true to the spirit of Doyle’s work while still doing something new and grounded. Then, it got stuck in a conundrum. Having completed the original arc of Watson and Holmes (Lucy Liu and Jonny Lee Miller) learning to trust each other, and Moriarty’s scheming halted, the show tried to change things up in the second season, focusing more on small arcs and character subplots to drive the action. Unfortunately, this was not enough of a change, and handled in a hit-or-miss fashion. Cases felt not as important, and in some cases, were pure filler, because the main thrust of the second season was the friction between the leads. Watson wanted to live her own life and keep moving forward; Holmes was dependent on maintaining the status quo he had managed to establishe. It’s an intriguing and realistic dynamic, and to “Elementary’s” credit the final few episodes handled this plot with the right sense of importance and respect. But the build up to the climax felt jerky and poorly done. So the writers took a gamble, made a big change, and stuck with it. When Season 2 ended, Holmes fled to London, severing his ties to New York City to take a job at MI-6. His former partner, Joan Watson, is thus on her own in New York, now an independent detective. And Season 3 takes this set up and runs with it: Watson has a handle on her new life, the cast has moved on and when Holmes does come back, so much has changed that it’s clear the status quo of the previous years isn’t going to return. “Elementary’s” writers are showing a real awareness of what works and what doesn’t work with their show, and as a result, the show is focusing on its strengths in ways it hasn’t since the first season finale. 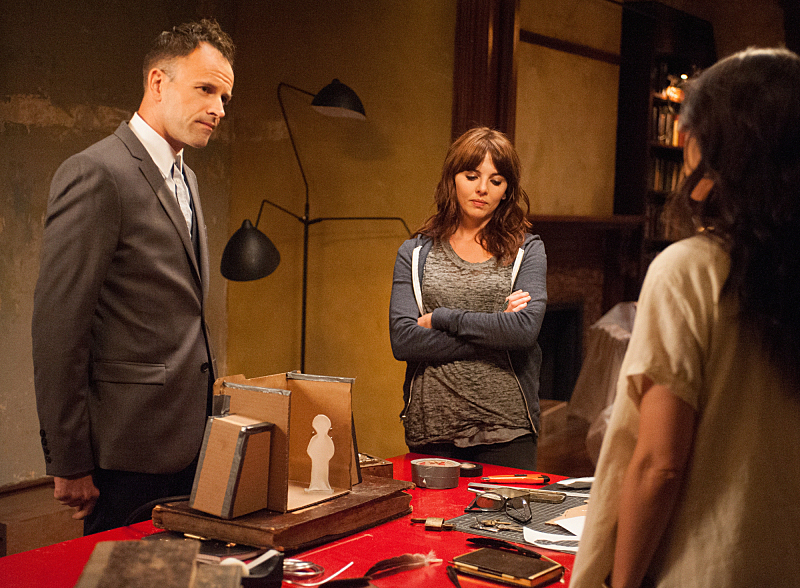 “Elementary” works best when it focuses on its people. The mysteries are important, but always serve to underline the character work; while the show follows the structure of police procedurals (with a new crime each week), it never tries to be as staid as its more formulaic peers. At their best, the cases of the week don’t feel disconnected from the characters — instead, they amplify what is going on between the cast. For watching Holmes deduce, and Watson learn from him and offer her own insight, allowed Miller and Liu to develop stronger chemistry while their characters grew closer. So, by separating the character work from the cases in some of the second season, the show faltered. Thus, the third season’s premiere, “Enough Nemesis To Go Around,” is important. It takes its time in establishing Watson’s new life — not just professional, but personal. When Holmes does return to New York, apparently having quit his new job after only eight months, it’s an instinctual return to old partnerships and habits, but one Watson quickly thwarts. Both Liu and Miller get a lot to work with, and the drama that dominates the episode feels more earned than half of the character bits in the second season. Not only did the writers decide to leave the main partnership forever changed, it added a new dynamic by giving Holmes a new partner, his protege Kitty Winter (Ophelia Lovibond), one of the major characters in Arthur Conan Doyle’s “The Adventure of the Illustrious Client.” When the three find themselves stuck on the same case, the show turns into both an engaging reunion and an awkward introduction, told through a locked-room mystery. Beyond cleverly mixing mysteries with character development, “Elementary’s” biggest strength is its focus on trauma and diversity. In this particular canon, Sherlock Holmes is a recovering drug addict and clinically depressed, and the show has also featured a wide selection of women, people of color and LGBTQ characters – not out of forced attempts at diversity, but rather as a reflection of reality. After two seasons focused on Holmes’ recovery from drugs and addiction to having Watson around, Kitty’s addition to the mix freshens things up, while adding a new viewpoint on someone recovering from a trauma. It’s that realistic focus on recovery and human fragility that really gives “Elementary” its heart. Kitty doesn’t just work as a new dynamic in the Holmes-Watson relationship, but also a symbol of how Holmes has grown. Lovibond’s performance sells the character in the minor details – nervous in the face of close contact, steely determined toward one goal and hesitant toward other topics. She’s not a third wheel, but a strong compliment to the two leads. Plus, it appears the writers are following the character’s canon backstory, so it should be interesting to see how else they adapt Conan Doyle’s original tale. It’s too early to judge the entire season – the demands of 24 episodes could lead to some installments feeling more like filler than necessary. But “Elementary’s” writers have seemed to learned from their faltering in the previous year. While the show never became bad, it definitely slumped compared to its debut — fortunately, with Season 3, we’re seeing what happens when creative teams acknowledge and learn from their mistakes. By refusing to hit the reset button and instead working in both new dynamics and more elements from the original canon, “Elementary” is moving forward as both a thrilling and engaging show. Season 3 is not more of the same, or a throwback to the show’s best work, but instead a display of actual growth and a willingness to try new directions.